Thirty days in our battery was about the average time to lose the moniker FNG (*ucking new guy) and it was a lonely month. FNGs were considered bad luck, had few friends and were assigned the worst jobs. Many tricks were played on them and they stayed outcasts until they demonstrated their reliability under fire. 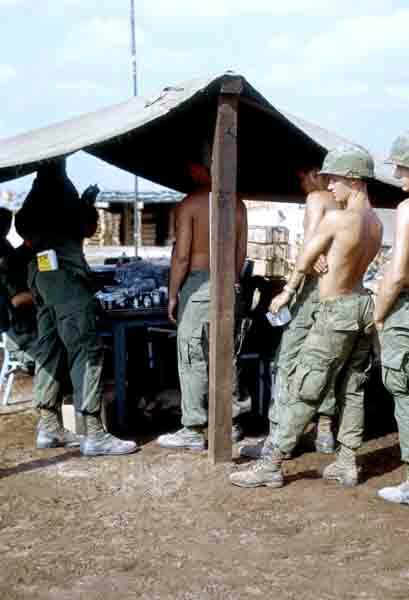 Newly arrived men received numerous injections on their first payday in the field. What a fine welcome that was. John Clark showed a new man with the last name Murdock, how to heat canned C-rations with surplus artillery shell powder. A few grains were put under the can and lit, the contents of the can were hot in seconds because powder burns very hot and quickly. John did not tell Murdock to punch holes in the can lid before lighting the powder. Before he could stand up from lighting it, the can launched and struck Murdock in the forehead, flipping him backwards. It took Murdock several days to recover his senses and lose the round imprint on his forehead.